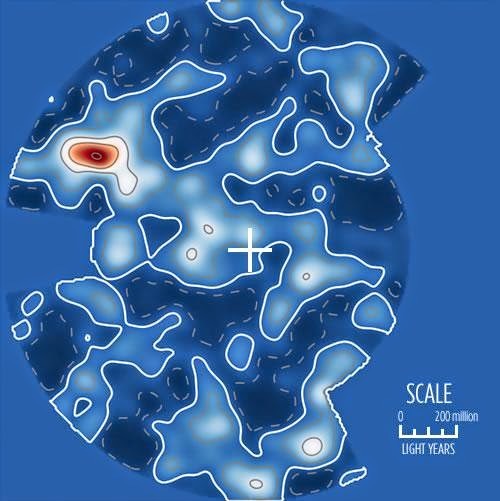 A group of astrophysicists from the University of Waterloo have generated the best yet 3D map of the universe. It spans almost two billion light years and it is expected that it could help better understand how space is growing and can also help in understanding dark matter. A white cross points the Milky Way galaxy. Areas with a number of galaxies are pointed out in light blue or white, while the red region is the Shapley Concentration, which has a vast number of galaxies in very close vicinity to one another. In contrast the dark blue regions have a small number of galaxies. The verge of the map, which is a uniformed blue color has not been observed yet. Even though humans will not travel to deep space anytime soon, having a map will be very useful because it will be able to display how the cosmos is expanding. Researchers have found that galaxies move in a different way. Our Milky Way and its neighbor The Great Andromeda Galaxy are, for instance, moving with roughly a speed of two million kilometers per hour.